Gaza Daily, August 15: A Deal for Israel to Recognize Hamas? UPDATE 1230 GMT: A meeting of the Israeli Security Cabinet this morning ended after three hours with no decisions about the ceasefire talks in Cairo. After the session, Economy Minister Naftali Bennett called for withdrawal from the discussions, saying they only empower Hamas and Israel should not make a deal with a terrorist group. Bennett called for a unilateral Israeli decision on the blockade of Gaza and the fishing zone off the coast. Under the long-term truce being negotiated in Cairo, Israel would recognize a Palestinian Government that includes Hamas, according to “a senior Egyptian official”. The two sides have been in talks since Monday seeking an end to the 38-day war in Gaza. Hamas and Islamic Jihad delegates said the emerging deal has no time limit, lifts the blockade on Gaza, and includes talks on construction of a Gazan seaport and airport within a month after the agreement is signed. They claimed that Israel asked Egyptian mediators to pursue its demand for the demilitarization of Gaza, but the Egyptians declined. If true, the terms would be a significant shift by Israel, which has never recognized Hamas. Israeli delegates had indicated they would not agree to the full lifting of the blockade, imposed since Hamas took power in Gaza in 2006, and had given no sign of acceptance of a seaport or airport. In addition, the Israeli Government has insisted that demilitarization must be part of any agreement. Palestinian representatives left Egypt on Thursday night for consultations. Israel’s delegation had already returned to West Jerusalem, where the Security Cabinet met for three hours on Thursday night with no decisions. Israeli Ministers will reconvene this morning. Earlier on Thursday, Khalil al-Haya, one of the Palestinians negotiators, told a rally in Gaza that any deal “must satisfy the demands of our people”, with the end of the blockade and “unjust incursions” by Israeli forces. It is unclear how the Government of Benjamin Netanyahu would convince the Israeli public, which has largely backed the war, that a resolution ending the blockade would represent “victory”. 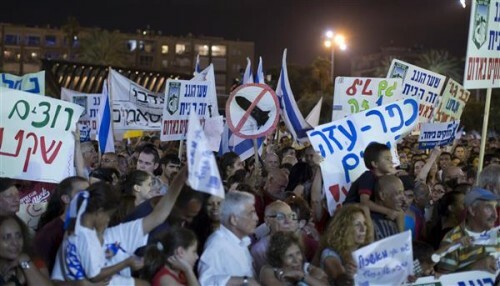 On Thursday night, a large rally in Tel Aviv expressed solidarity for the residents of the south.